"Through fifteen years of time...The countdown to Adventure, begins now--"
May 20th, 2016. The official Premium Bandai web shop updated with a teaser page for the D-Ark Ver. 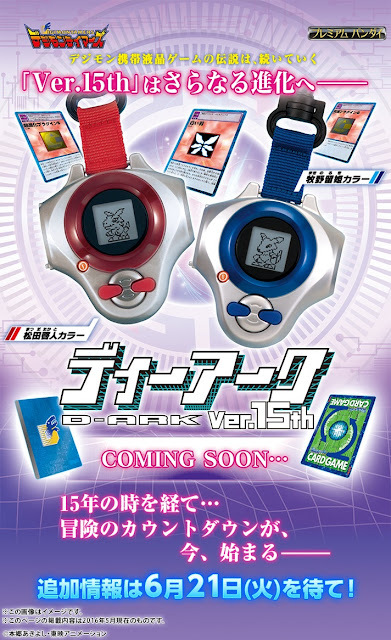 15th Digivice, which was previously leaked yesterday in an early issue of V Jump magazine. As revealed in V Jump, the first colors for the D-Ark will be Matsuda Takato (red) and Makino Ruki. (Blue) Mirroring the original D-Ark toy, accompanying trading cards are depicted in the teaser, likely for card slash functionality. The page promises a further evolution of the Ver. 15th series, with additional information scheduled for on June 21st. A list of devices the D-Ark Ver. 15th is intended to be compatible with is not yet public. The original D-Ark was somewhat disruptive within its own time for being incompatible with the first virtual pets and Digivices, only having compatibility with the Pendulum series, Pendulum Progress, and D-3. This Ver. 15th's tagline is an allusion to Digimon Tamers' opening theme The Biggest Dreamer, although it references a part of the lyrics not heard in its TV size version--"For a long time / I've heard the countdown / I'm prepared / Let's start now, change into zero!" The toy is preceded by the D-3 Ver. 15th, which will be distributed next month.